Warning: Workplace flirtation may cause side effects. Super-geek physician Sam Sherazi, M.D., is clueless about anything that can’t be learned from a textbook. Most people assume he’s an intellectual a-hole with a God complex, but Sam doesn’t need a sparkling bedside manner to treat his patients. Besides, he’d rather not encourage the countless women who are solely attracted to the two little letters at the end of his name—something that’s rubbed him the wrong way ever since he finished med school. But when Lorie Braddock walks into Sam’s office, he finds himself wanting to rub her all sorts of right. At twenty-five, former beauty queen Lorie Braddock is finally living life on her terms. She’s moved to the big city, landed her dream job, and traded her titles and tiaras for power suits and promotions. But while Lorie’s sprinting up the corporate ladder, her dating life is guided by one simple rule: Don’t dip your pen in the company ink. Until Dr. Sam Sherazi starts invading her thoughts . . . and steaming up her phone with the kind of sexting that makes her want to rewrite all her rules. Evie Clarie’s red-hot romances can be enjoyed together or separately: LET’S TALK ABOUT SEXT • I WANNA SEXT YOU UP This ebook includes an excerpt from another Loveswept title. 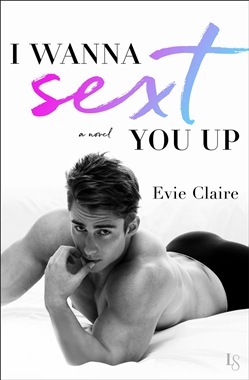 Acquista I Wanna Sext You Up in Epub: dopo aver letto l’ebook I Wanna Sext You Up di Evie Claire ti invitiamo a lasciarci una Recensione qui sotto: sarà utile agli utenti che non abbiano ancora letto questo libro e che vogliano avere delle opinioni altrui. L’opinione su di un libro è molto soggettiva e per questo leggere eventuali recensioni negative non ci dovrà frenare dall’acquisto, anzi dovrà spingerci ad acquistare il libro in fretta per poter dire la nostra ed eventualmente smentire quanto commentato da altri, contribuendo ad arricchire più possibile i commenti e dare sempre più spunti di confronto al pubblico online.